There has been footage uncovered of our U.S. military taking down ISIS. This is the best video of instant justice ever and I am sure you will agree that it is EPIC! This particular video has been watched over a million times and it was taken during the evening hours. 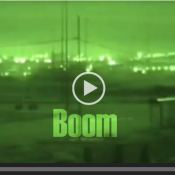 It shows ISIS shooting at a U.S. helicopter, and our military retaliated with BRUTAL force! The response to ISIS’s attack is a stark reminder of all those who put their lives on the line to keep our country safe. Please watch and share! This video will leave you breathless!